Toe nail fungus is commonly caused by a fungus known as dermatophyte, and sometimes, it is caused by certain types of yeast or molds. 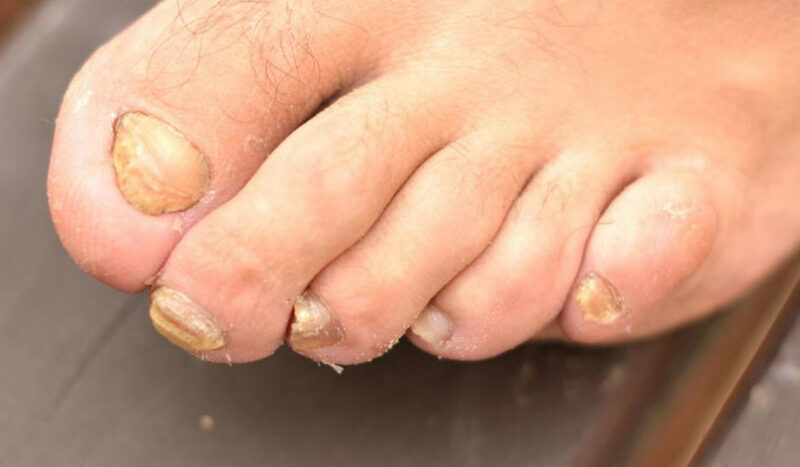 If you notice that one or more of your toe nails have become thick, have a yellow or whitish discoloration, smell foul or has developed a dark color due to debris building up in the nail bed, your toe nails have been infected by fungus. You can get toe nail fungus if your feet are regularly confined within shoes for a prolonged period of time. The fungus grows in a warm and moist environment. Due to sweat, your feet are susceptible to toe nail fungus infection, especially when the shoes are not properly cleaned or aired out, or if you do not change your socks daily. Toe nail fungus is also caused due to the use of unhygienic tools for a pedicure in salons. People over the age of 65 years are more susceptible to toe nail infection among adults. It has been observed more among men than among women. Children rarely have toe nail fungal infection. The symptoms of toe nail fungal infection are quite common with other infection that affect the nail. So, a lab analysis or just checking a scraping of your toenail under the microscope can tell your doctor whether you have toe nail fungus. Keep your shoe socks clean: People who were closed shoes for long hours every day are more prone to toe nail fungus infection. This becomes there is no free flow of air, and the sweat from your feet does not dry out. This cause fungus to thrive inside your dirty shoes and socks, leading your toenails to be infected. Ensure that you air out your shoes at the end of each day. Do not let any moisture accumulate in your shoes. Wear a neat pair of socks every day. Foot hygiene: Apart from your footwear, you should always take care of your foot hygiene. Keep your feet clean is not exactly a toenail fungus remedy, but more of an infection prevention technique. Clean your feet, toes, and areas between the toes thoroughly before you go to bed. Ensure that you dry your feet well with a clean, dry towel. Take care especially of small nooks and crannies of your feet where moisture tends to readily accumulate. Use an antifungal foot powder to keep your feet completely dry and prevent your toenails from getting infected. Apple cider vinegar: Apple cider vinegar is one of the effective toe nail fungus remedies that help to avert the infection from spreading further. By killing off fungi and bacteria, apple cider vinegar shows improvement within a few weeks. Make a solution of even parts water and apple cider vinegar soak the affected toenails in the solution for about 30 minutes. Dry off completely with a clean towel. Do this daily for a few weeks. Tea tree oil: With immense antifungal and antiseptic properties, tea tree oil is used quite widely for a number foreskin infection remedies including toe nail fungus remedies. Mix one teaspoon of coconut oil or olive oil with a few drops of tea tree oil. Apply this to the affected areas with a clean and dry cotton ball. Leave this for about 10 minutes. Using a soft brush (such as a baby toothbrush), scrub the affected toenails gently. You can do this for two to three time daily until you see a healthy change in the appearance of your toenails. Oregano oil: One of the most popular home-based toe nail fungus remedies, Oregano oil is an effective remedy. This is due to its antifungal, antiseptic, antiviral, antiparasitic and analgesic properties. Take two drops of oregano oil mixed with a teaspoon of olive oil. Apply this to the affected areas with a clean and dry cotton ball. Leave this for about 30 minutes. Wash it odd and using a clean, soft towel, dry off your toes completely. Do this one or two times daily for at least three weeks.